Flyers, sometimes called leaflets, inserts, or circulars depending on how they’re used, are a single unfolded 8.5” x 11” or A4 size sheet of paper with a beautiful graphic and a very simple message printed on one side. They’re a great way for individuals and small to medium sized businesses to promote products, services and events without breaking the bank. Create an enticing flyer for your next bake sale with this great flyer maker template. Use the stock photos provided or upload your own photos of your terrific cakes and cookies. You’ll find loads of icons to choose from to identify your sale for Christmas or other times of the year. 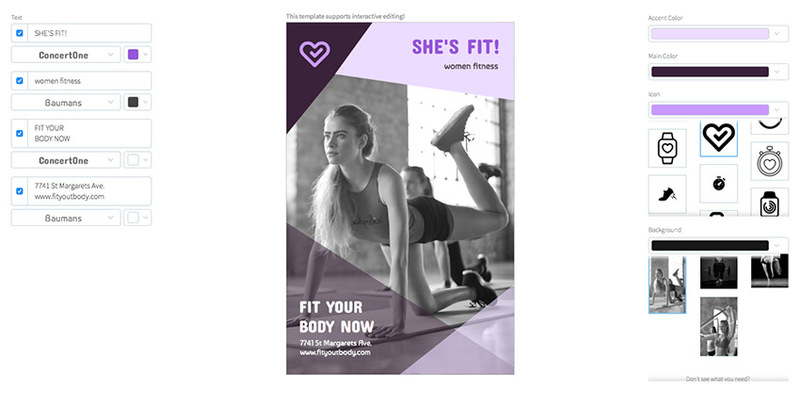 If you want an eye-catching flyer to promote the launch of your women’s fitness club, this flyer is just thing to attract the clients you want. The template uses dynamic geometric shapes (which can be colour customised to reflect your brand) to frame fantastic images of female bodies in motion. Add your text and logo, and with very little effort, you’ve created an excellent flyer. Looking for some flyer design inspiration for creating a beautiful interior design flyer? This template is designed specifically for home remodelling companies. It’s super easy to customise: just enter your information in the flyer creator, choose a photo to feature on your flyer, select your colour scheme, and you’re ready to download and print. Another terrific flyer design template for home renovators, this template uses interesting shapes to highlight photos of interiors and then move the reader’s eye to the header text. Use this auto workshop flyer template to design the perfect flyers for mechanic workshops. Choose a background image or upload one of your own, type in your information, and you’re ready to download your professional automotive flyer! Create a flyer design online for your medical lab, hospital, doctor’s office, or dental clinic using this flyer design template. The template features tons of medical images and icons like laboratory flasks, bandages, ambulances, and stethoscopes, which you can use to create your own unique flyer design.